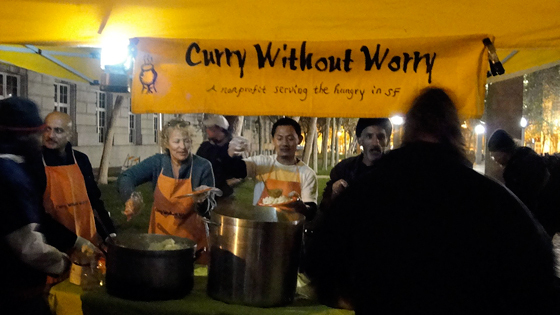 Curry Without Worry feeds approximately 250 every Tuesday night at the UN Plaza. My neighbor, Catherine Lyons, would often stop by with a big bag of day old pastries from La Boulange Bakery. Almond croissants and palmiers, even a day old, are still quite good. After eating myself into a carb and sugar coma a few times, I started waving her away. “You are a terrible person,” I would yell at her, but quickly cave in to something sugary. As it turned out, she wasn’t such a terrible person. These day-old pastries were bound for Curry Without Worry, a small non-profit organization that she volunteers with. 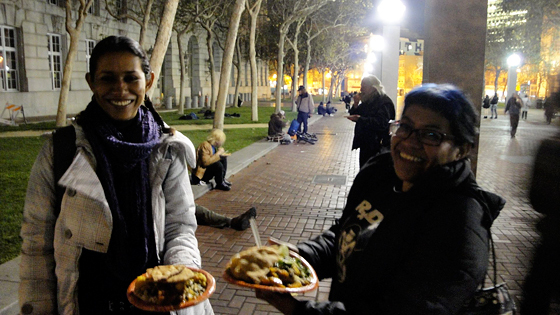 The group provides a free dinner at the U.N. Plaza near the Civic Center every Tuesday night. Despite the baked goods set out for dessert, it’s one of the healthiest meals around. Volunteers ladle out rice, and then top it with a nine-bean soup, a specialty from Nepal, along with curried vegetables, spicy achar, or tomato and timur chutney and homemade whole-wheat flatbread. Shrawan Nepali serves bowls of nine-bean soup to the volunteers in the test kitchen before they all head out to serve the food. The founder of Curry Without Worry, Shrawan Nepali, has shoulder length salt and pepper hair, brown eyes that sparkle like he’s about to break into a smile, and a lightness to him, as if he seems to defy gravity. He played drums and sang while the food was served and then took breaks to walk around and shake hands and thank people for coming. 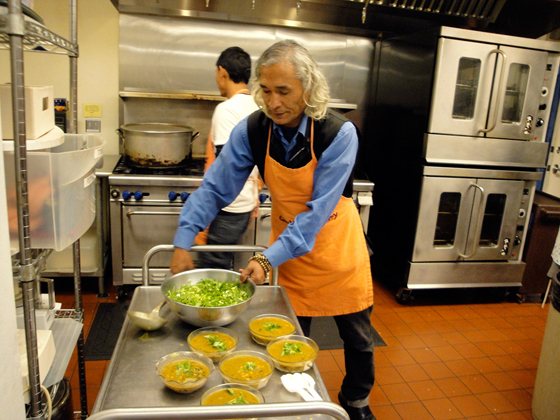 They feed approximately 250 people in San Francisco, and 300 in Katmandu, Nepal every Tuesday night. Shrawan’s last name is Nepali, which is given to children who grow up in orphanages in Nepal. He had little self-pity when it came to his fate, and explained, “The orphanage was wonderful. We were like a family where I had 50 brothers.” While in the orphanage, he met volunteers for the Peace Corps who sponsored him to come to the United States for college in North Carolina. After earning a degree in economics at Warren Wilson College, he moved to San Francisco and started working as an accountant. He then earned an MBA from Lincoln University, which was once based in San Francisco, but is now in Oakland. While he was doing well financially, he felt that he was missing his purpose in life and he wanted to make a difference in other peoples’ lives. So he started the Ama Foundation in 2001 in order to open an orphanage in Nepal. It is now home to 50 orphans in Katmandu. He also loved to cook, and so bought the restaurant, “Taste of the Himalayas” in San Francisco. Then he decided that he wanted to give back. “I want to show my gratitude to this beautiful city.” As well, he was shocked that even here, people went hungry and ate from garbage cans. With a group friends and a sympathetic security guard who worked at the UN Plaza, he served his first meal in December of 2006 to about 50 people. Currently, to comply with health codes, he rents a commercial kitchen to prepare the food, but then sets up under a tent at 5:30 pm every Tuesday night, rain or shine. A long line has often formed by the time the volunteers start serving. Shrawan estimated that about 60 percent of the people fed were homeless, and 40 percent students, city workers and tourists or travelers. The people waiting in line were diverse. Some looked like they had been down on their luck for some time, and carried their belongings in a cart, while others wore sporty ski jackets and hand knitted hats; some were handicapped and others wheeling bikes. A few carried to-go containers for shut in family members. Alisha Pelton certainly did not look homeless. She was in her early twenties and had a healthy glow. It also has made it onto the backpacker circuit and a young, international crowd lined up for curry. Gisel Mociño, a student visiting from Mexico City, explained that while she really liked the curry, she still kind of missed the street food in her hometown. Mayek Querales (left) and Gisel Mociño (right) are college students visiting from Mexico City. My neighbor Catherine Lyons ladling achar over the curry, rice and nine-bean soup while Shrawan Nepali chats with people in the background. 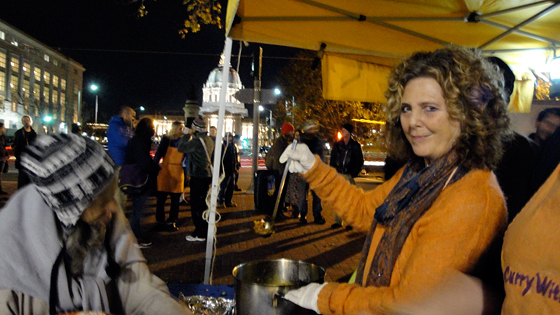 The winter night grew chillier, and volunteers continued to ladle out nine-bean soup. Scents of coriander, turmeric, cardamom and bay filled the air. Murmurs of “thank you” and responses of “namaste” were passed between patrons and volunteers. The line grew shorter, but still people were beckoned by the music and warm food. My neighbor Catherine ladled achar or tomato chutney onto people’s plates. The goal for Curry Without Worry is to continue to feed the needy in San Francisco, and in Katmandu, where most of the people served are street children and the elderly and handicapped. In San Francisco, it takes an estimated $1.00-$2.00 to feed each person, and in Katmandu, the cost is 50 cents. So this holiday season, please feel free to volunteer on a Tuesday evening or donate money to them so they can continue to feed people.